Keith Orchison wrote last December on the UN climate policy debate in Durban. This was the real point of biff in the Durban debate." A group of people who hold extreme views on personal freedom over social responsibility regard proposals for action on green-house gas emissions with great suspicion. Those inclined to this extremist political ideology fear that any coordinated global response intended to lower the level of carbon dioxide in the atmosphere amounts to a conspiracy to transfer wealth from the United States to developing countries. The fears held today by these extremists reflect the perception the commentator gave of the start of negotiations 20 years ago: "the industrialised world had to vacate (emissions) space for the emerging world to grow. Money and technology transfer would enable emerging countries to avoid future emissions growth..."
Time and technology marches on. The perception of what seemed necessary 20 years ago no longer holds true. Those fears still held today can be overcome by smarter development in the emerging world. This outcome is by the way a vindication of the economic philosophy of Adam Smith that rational action in the pursuit of self interest will foster innovations that address resource shortages. The alternate economic ideology that Thomas Malthus described sees finite economic resources as an absolute barrier to economic development. If you look again at the statement "the industrialised world had to vacate (emissions) space for the emerging world to grow. Money and technology transfer would enable emerging countries to avoid future emissions growth..." you can see that it contains the implicit assumption that the Malthusian economic ideology is inescapable. 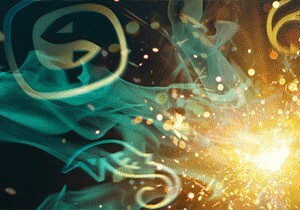 Twenty years ago energy generation was economical when accompanied by emissions of large quantities of carbon dioxide. The rate of emissions was about 1 tonne of carbon dioxide for each megawatt-hour of electrical energy. That is about 1 kilogram (2.2 pounds) for each kilowatt-hour. The developing world is no longer limited to using old technology with which much of the industrialised world is saddled. Innovation and creativity has helped advance technologies for the developing world to generate affordable and reliable energy in new ways with little or no emissions of carbon dioxide. A very broad range of alternate options are now available and even more are the subject of advanced research projects. Design of a high temperature solar furnace that can achieve a concentration ratio of 20,000 suns. The furnace consists of three optical elements: a primary mirror, a secondary mirror, and a compound parabolic concentrator (CPC). 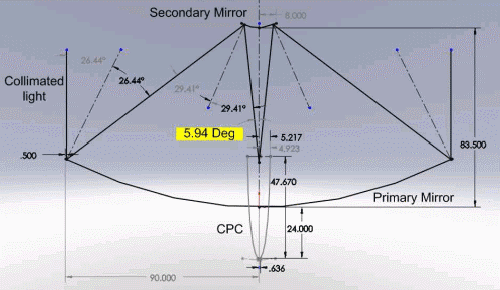 The mass production of large parabolic mirrors will rapidly reduce the cost of solar furnaces. The manufacture of 3,000 parabolic dishes each 15 metres in diameter for the Square Kilometre Array project in Africa provides the opportunity to roll-out solar furnaces at a lower cost than has been possible until now. 3M has developed a reflective polymer film that can be applied to parabolic dishes to create highly reflective mirrors at a much lower cost than mirrors made from glass or metal. 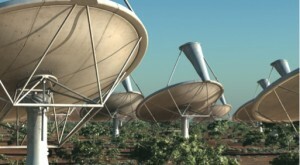 "Since the announcement that South Africa, along with its eight SKA partner countries in Africa, will host the mid-frequency dish array and dense aperture array of the iconic SKA telescope congratulatory messages have been pouring in from around the globe praising the hard work of the South African SKA team and the unwavering support for Africa's site bid from the South African government." Dishes will form a substantial part of the SKA; around 3000 dishes, each 15 m in diameter, are currently planned. Many aspects of the SKA dish-design challenge are without precedent, not only because of the large numbers of dishes required, but also because of the huge sensitivity that will result. The manufacture of composite reflectors for this size of antenna has been done in the past. These were for military applications however, and the history of prior manufacturing is such that the reflectors were one-off, very heavily invested in materials and manual labour costs, and not designed to have the serial manufacturing requirements of the scale envisioned for this project. Given the unique nature of the requirements, the SKA manufacturing program was approached from a standpoint of optimization of the production capability of the reflectors, while retaining the baseline requirements for performance and durability. All aspects of reflector manufacture were examined for achieving optimal production and cost of delivered reflectors. A detailed analysis of the potential production costs of delivery of the SKA Phase 2 requirements, 3,000 reflectors over 4 years is presented here. ...The cost of a complete composite reflector assembly (surface and backing structure) was determined to be $US45,000 ($US398 per square metre) for Phase 2. Discussion about energy is riddled with value-laden beliefs. Renewable energy is "clean" / Fossil fuel energy is "dirty". Fossil fuel energy is cheap and reliable / Renewable energy is expensive and unreliable. Two samples of syngas created from two different raw materials contain identical quantities of chemical energy. Two samples of hydrogen created from the same two raw materials contain identical quantities of chemical energy. One of the two raw materials is cellulose. This is a renewable energy resource produced from sunlight, water and carbon dioxide by photosynthesis in plants. The second of the two raw materials is polyethylene terephthalate, or PET. This is a non-renewable polymer made from fossil carbon resources. It is the plastic from which many disposable drink containers are made. Both of these raw materials are compounds of carbon, hydrogen and oxygen. Hydrogen - where none of the carbon in the raw material remains in the resulting fuel and all of it may be separated in carbon dioxide. The processes for transforming these two raw materials into any one of three different fuels can be applied to any raw material containing carbon, such as coal, lignite, natural gas, energy crops, organic waste, plastics and paper. 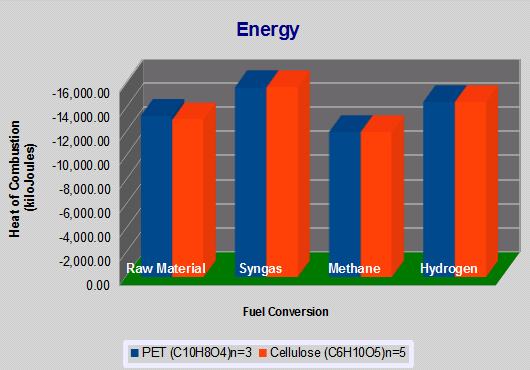 A variety of technologies exist for each of these three fuel transformations. Technologies also exist for separating and storing carbon dioxide. A question our political leaders and industry leaders need to answer is why these technologies are being ignored and are not being actively implemented? A further question is why are unproven and unneeded technologies being developed that substantially delay the time when we will see carbon capture and storage in everyday use? "Capture technologies include: Pre-combustion capture refers to taking the primary fuel (e.g. coal) and converting it into gas. The gas produced is chemically altered to CO2 and hydrogen. The CO2 is separated from the hydrogen, compressed and transported to a suitable storage site." "An advanced integrated gasification combined cycle (IGCC) power plant, which will convert coal fuel into hydrogen to generate enough power to support 160,000 homes, and a chemical plant that will produce nitrogen-based fertilizers. The plant will also capture more than 90 percent of the CO2, which means that the fertilizer and power produced by the project will have a significantly smaller carbon footprint than those produced by conventional facilities, including those using natural gas. The project will create more than 2,000 construction jobs over 3 years and approximately 100 permanent operational positions." Scientific knowledge has developed over centuries. The journey of discovery includes long periods of experiments and the collecting of careful measurements (empirical data). Every once in a great while important milestones occur when a pattern in this data is recognised. Identifying chemical compounds, chemical elements and developing processes to separate mixtures of each progressed gradually over centuries. 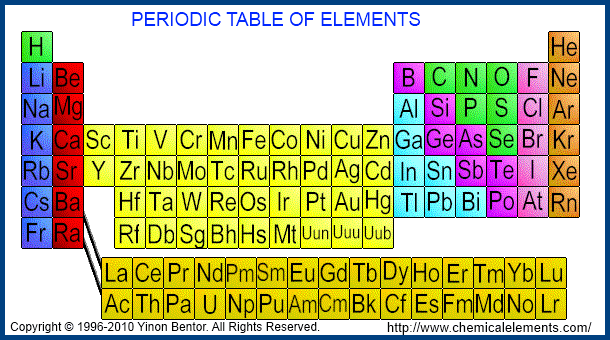 A major milestone was reached in 1869 when Dmitri Ivanovich Mendeleev proposed a Period of Table of Chemical Elements that fitted the known elements according to patterns of physical properties that many scientists and researchers had discovered and studied. The Periodic Table of Chemical Elements originally contained gaps that suggested a number of chemical elements may exist and that remained to be discovered. Another milestone occurred at the dawn of the twentieth century when Marie Curie revealed two revolutionary ideas for which she was awarded Nobel Prizes in Physics and in Chemistry. Together with her husband, she was awarded half of the Nobel Prize for Physics in 1903 for their study into the spontaneous radiation discovered by Henri Becquerel in 1896, who was awarded the other half of the Prize. Marie Curie was awarded a second Nobel Prize, in Chemistry, in 1911. This type of scientific milestone is different in character to the work of Mendeleev. 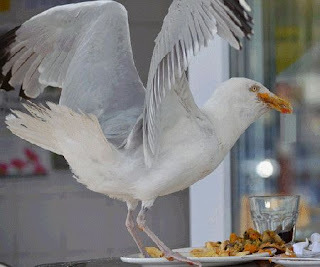 It occurs when completely new and previously unknown features of the natural world are revealed. It built on Mendeleev's work - Marie Curie's insights were gained after she discovered two new chemical elements, polonium and radium and devised techniques to isolate radium in sufficient quantities to study its properties. Polonium is named after her homeland, Poland. Radium's radioactivity was so great that it could not be ignored. It seemed to contradict the principle of the conservation of energy and therefore forced a reconsideration of the foundations of physics. On the experimental level the discovery of radium provided men like Ernest Rutherford with sources of radioactivity with which they could probe the structure of the atom. Rutherford conducted experiments with alpha radiation and as a result in 1910 introduced a new model of an atom that contained a minute nucleus possessing almost all the atom's mass. The first half of the twentieth century was a period of remarkable scientific advances including Niels Bohr's atomic model (1913), Erwin Schrödinger's development of quantum mechanics (1925) and Albert Einstein's theory of mass-energy equivalence (1905) among numerous others. It was also remarkable for an "embarrassment of riches" of fundamental sub-atomic particles that were discovered. At first each discoverer of a new sub-atomic particle was almost guaranteed a Nobel Prize in Physics. Later, each new discovery was greeted with dismay at the growing complexity of what was originally thought to be a simple quest to identify and characterise a limited number of fundamental particles. The identification of new sub-atomic particles continued and eventually in the mid 1960s a model to fit all this empirical evidence into a coherent framework was more-or-less settled. This model known as The Standard Model of Fundamental Particles and Interactions parallels the breakthrough that Mendeleev's Periodic Table of Chemical Elements achieved in 1869. Like Mendeleev's model of one century earlier, The Standard Model of Fundamental Particles and Interactions also identified a number of missing pieces that, if the model was correct, should be able to be found. Of the missing pieces, the Higgs boson was predicted and its existence was crucial in checking the validity of the Standard Model. "If you take a fish shop, well, there’s the fuel that the fishing boats use, there’s the power that they use at the markets to freeze things, there’s the transport which gets the fish to the markets and to the shops. 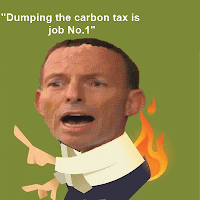 All of this is going to be impacted by the carbon tax and this is why this carbon tax is so toxic for the families and the workers of Australia." "Small business will be hit the worst because they must pay for the tax at every single step in their production cycle. The fish and chip shop owner will pay the carbon tax from the minute the trawler fills up its diesel fuel tanks to go out to sea, through the machinery that processes and cleans the fish, the refrigeration costs that are set to skyrocket, right through to the delivery to the shop and the lights that need to flash outside the front door to attract passers-by." Worth the dung on which it's written? "Yesterday it was revealed that a leading Australian and international business group boasting up to 300 firms including Westpac and GE supported the Gillard government's carbon price. And they took out ads across the nation to prove it. However, after some scrutiny by the opposition, turns out the group is made up largely of obscure operations - none of which would be liable to pay the tax. Only one company, AGL, is listed as a liable entity which would have to directly pay the tax. Alongside some of the big names was ....a fish and chip shop. ..."
Great work Simon. Subtle. Biting.